When we work together, we can do more for veterinary medicine and animal health. 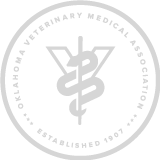 The Oklahoma Veterinary Medical Association (OVMA) is a professional trade organization for veterinarians. The association was formed in 1907 and incorporated in 1934. The membership of the association is composed of more than 1,000 individual Oklahoma veterinarians, Oklahoma State University Center for Veterinary Health Sciences faculty, veterinary students, out-of-state veterinarians, and allied members. Member veterinarians enjoy many benefits of belonging to the OVMA. They are bound to the common goals of animal welfare and professionalism. Every year, each veterinarian licensed in Oklahoma must obtain 20 hours of continuing education to maintain their license to practice veterinary medicine in Oklahoma. The OVMA is a source for their education. cooperate with all organizations, agencies, and persons whose objectives are consistent with those of the OVMA. You will receive our quarterly newsletter, the Communique, updating you with what your fellow veterinarians are doing around the state. You will have access to the DVM Listserve, a way to connect to veterinarians around the state to discuss issues, ideas or comments with your peers. You will have access to free classified advertising on the OVMA website and in the newsletter. You will have access to a list of veterinarians across the state interested in relief work. You will have access to local CE sessions with top-notch speakers. 2nd year Graduate: $13 / mo. OSU/CVHS Faculty: $15 / mo. Still have questions? You can reach us directly at (405) 478-1002.